Melanie Meriney is a country – pop singer/songwriter from Pittsburgh, Pennsylvania. Melanie moved to Nashville to attend Belmont University as a Songwriting/English Major and still resides in Nashville and released her debut EP All the Good Songs produced by Phil Ricciardi and Mike Puwal in 2012. Melanie has been nominated for a Nashville Independent Music Award (NIMA) for Best Female Country Artist and has opened for artists such as Little Big Town, the Commodores, Rick Vito of Fleetwood Mac, and Steve Augeri of Journey, as well as headlining many festivals. In 2016 Melanie signed a publishing deal with Dune Grass Music and has been mentioned in Billboard, Country Aircheck, and Music Row Magazine as a developing pop-country scene contender. 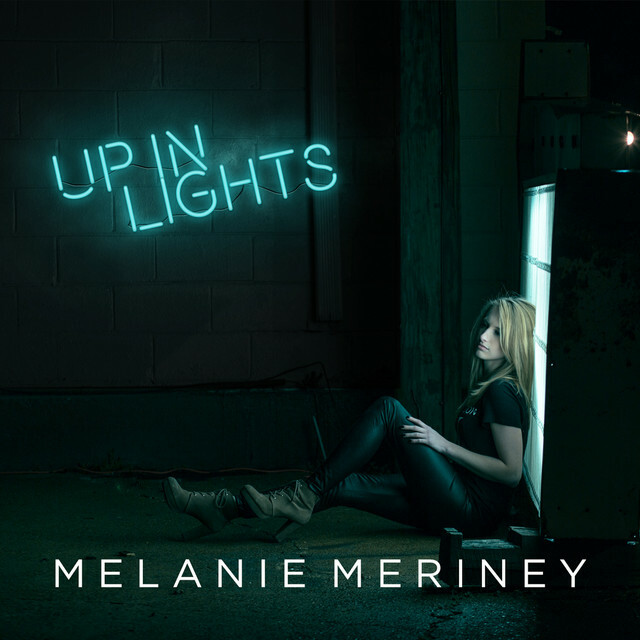 Last year, Melanie released her second EP Up In Lights which features six tracks including her most recent single Lifeboat. We caught up with Melanie to discuss her EP, her songwriting and much more. How has your week been, what have you been up to? It’s been a good week so far- keeping busy trying to book some shows for later in the year. Could you please introduce yourself and give us a bit about your background? My name is Melanie Meriney and I’m a pop/country artist from Pittsburgh, Pennsylvania, based in Nashville, TN. I grew up in a northern city where country music isn’t extremely popular, so I get a lot of my influences from other genres like pop, hip-hop, rock, etc. My mom always listened to country radio around the house which is how I started listening to it. Your sound is very pop country as you mentioned but it has a bit of rock in it too – did growing up in Pittsburgh have influence as I hear it is quite a heavy metal area? Yes! I had metal and rock musician friends growing up, so I used to go support them at their shows. While this was an influence, I think my main rock influence comes from my dad- he taught me all about 70s and 80s rock bands as well as some more contemporary groups. My dad is my music buddy- he is always teaching me about bands and cuing me into new music. I listen to anything I think sounds cool! My favorites lately are Grace Potter and Fleetwood Mac. At University you majored in songwriting/English – would you say this has helped you as a songwriter or just brought out something that was already there and would you advise aspiring songwriters to study it? The songwriting program at Belmont is great for honing your craft. You need to try out for the major, so they have you come in already expecting that you know the basics. It was great for me to practice writing in an environment with deadlines and timed writes. If you get a publishing deal, you are expected to meet a quota and schedule writes (not just when inspiration hits). My English major was useful in songwriting in the way that I already had a broad way of thinking about symbolism, word play, etc. I would definitely recommend the classes I took to other aspiring songwriters. I am really enjoying the song Drama, I think it is a perfect start to a great EP and makes you want to listen to the rest of it. Tell us a bit about the writing process behind it. I heard you wrote it with the mindset of it being sung by a male artist? Thank you! ‘Drama’ is actually my personal favorite on the EP. As a writer, I do a lot of pitching as well as singing the songs I write. When Michael Funk and I originally began writing it, we assumed a guy might want to sing it because guys always talk about how dramatic girls can be. But as I played it out at writer’s rounds around town, I had girls come up to me afterwards and say that they could really relate! Because I also wrote it from a personal place, it was a song that rung true for me at a point in my life. I thought it was a unique choice for the album. You released your EP Up In Lights last year – how hard or easy is it to put an EP together with a short collection of songs being selected? I’d say it was both easy and difficult. I wanted this EP to represent my progress as a songwriter and a person since my move to Nashville. I started out with 3 songs I had written in the past that I definitely wanted to include: Drama, Lifeboat, and Up In Lights. Drugstore Makeup & Lipstick on a Microphone I wrote specifically for the album. The album is largely about identity. For Drugstore Makeup, I wanted a song that spoke about my Pittsburgh roots. Lipstick on a Microphone was meant to show some of the rock influence I had gotten growing up. We added Mixed Drink at the last minute because I was missing a more light-hearted, country song. I originally recorded it as a possible pitch for my publishing company, and after hearing it over the course of a few months, decided I might want to cut it myself as an artist. When you write a new song, who is your go to person to hear it first and get feedback? My parents! I send almost everything to them. They are pretty honest when it comes to their opinions, so I can depend on them to be straightforward with me. You released Lifeboat as a single, tell us a little bit about the story behind the song please? Lifeboat is my English-major coming out. I keep notes in my phone when I think of cool song ideas. I was really into those one-word titles for a while, and “lifeboat” had been in my phone for a bit. I thought it was a cool symbol concept, especially because I could take an inanimate object and make it into a person. I basically constructed a story around the word, and actually wrote the whole thing within about half an hour. I had been waiting for a co-writer with car trouble to show up, but the lines kept coming to me, so by the time she got there, we ended up writing something else. How do you decide on what song will be a single? I take my radio team’s advice when it comes to that- they know the market and the stations better than I do, so are good predictors of what is going to be successful on radio. They take into consideration genre-affiliation (if a song is too pop, it might not perform as well) and wide appeal indicators. The video of it looks…challenging, were there any outtakes? I was worried you were going to fall in the water, I assume there were safety measures in place? Haha! No safety measures except knowing how to swim! The cliffs are ones people jump off all the time, so we knew the water level before having the actors do the jump. Honestly, it ran pretty smoothly, which was a relief. We filmed the boat scene from a friend’s boat, and other than trying not to get other Labor Day boaters in the shot, it was pretty easy. The most difficult part of it was actually shooting consistently with the daylight. We ended up doing one cliff jump on one day, and going back the next day to get the same daylight and water angles. I think the second day the actors probably jumped 3 or 4 times to get all the shots. Luckily, it was a hot weekend! You have opened up for some wonderful artists such as Little Big Town, tell us a bit about those experiences and do you have any stand out moments? Yes! Before the show, Kimberly from LBT told me my earrings were awesome, which made my night! I also had Steve Augeri from Journey compliment one of the songs in my set, as well as a whole adventure in Memphis with The Commodores (that one would take a while to describe)! I feel very fortunate to have been able to share a lineup with some very talented bands and hope it keeps going! What will 2018 bring? What have you got in the works? I feel like I’m constantly working on music, whether it’s writing, recording, practicing, networking, booking, etc. There’s honestly not much else I want to do! It doesn’t feel like work to me. I do try to get friend time in to go and hang out. Growing up, I played ice hockey and loved that- there aren’t many opportunities to play down in Nashville, so I’ve gotten away from sports a bit, but it was always something I enjoyed. Any plans to visit the UK? I would love to! Just need the money and some venues that will book me! Do you know much about UK Country? I need to get better versed in the UK scene! Everything I’ve heard so far, I’ve loved. Thank you so much Hannah!! I appreciate it!